Quadcopters from imaginery becomes true. Home / Archive by Category "Tech"
DJI Mavic is drone that can follow you automatically! If you did not know by now, DJI has just recently announced a brand-new model of drone that can follow you. I am, of course, talking about the newest beast coming straight from their labs. It has an interesting name – DJI MAVIC and a whole heap of amazing features that justify its price range across all segments. Keep in mind that this drone has not yet been released. Despite this, you can pre-order it via Amazon. For $999 you will get the brand new DJI Mavic drone. If you want to opt for their so-called “Starter Bundle” you will have to splash out a couple more bucks because it is currently priced at $1,079. The Starter Bundle includes a DJI Smart Battery with built in sensors and bright LED battery status indicators. In my honest opinion, the battery is totally worth the extra price and I warmly recommend it to you. You might wonder why is this drone better than DJI’s flagship models such as the Phantom series… Well, this bad boy is packed with more sensors and has the ability to fold (more on that later on), but most importantly, its maximum range and flight times are far more superior than those of Phantom drones. With its maximum flight duration of up to 27 minutes and maximum lag-free control range of up to 7 kilometers (nope, that’s not a typo), I’m sure you begin to understand why this could be the next big thing in premium drones market. For a drone that costs a proper fortune, people tend to expect a lot of useful features. Luckily, DJI Mavic doesn’t fail to deliver as it is packed with awesome functions and great specifications that will surely become new standards for premium drones. The first thing that you will most likely notice when you start doing your research on DJI Mavic is the fact that it is a foldable drone. This means that you are able to fold it in a certain way which allows for care-free transportation inside of small spaces. It’s becomes an incredibly compact device once folded and you can take it anywhere you want with you by placing it into your purse, backpack or something similar. Among all of its sensors and extra features, it is very important to mention that this little guy has the famous follow me mode feature, which means Mavic is one of the newest drones that can follow you. Nowadays, it is by far the most desired feature across all drones which is not surprising considering it’s extremely simple but provides great usage scenarios. In addition to the follow me function, DJI Mavic has smart systems along with GPS/GLONASS navigation which makes both flying and video recording a greatly enjoyable experience. With its crisp clear 4K camera and excellent stabilization systems, this little drone is able to provide you with exceptionally smooth images and videos time in and time out. All in all, if you are looking for a brand-new drone that is easy to carry, easy to fly and above all – extremely fun to play with, then you cannot go wrong with DJI Mavic. The best drone is not best drone you can find under $100 but this article is made by my personal thinking. 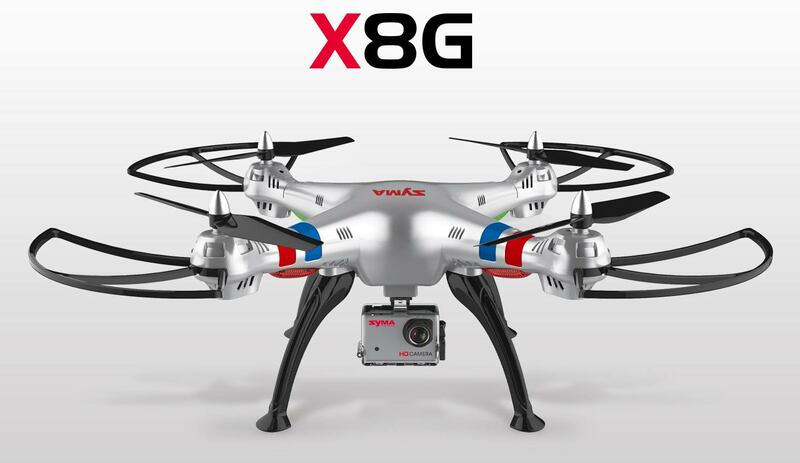 For me, SYMA X8C is best drone under $100.I am proud owner of one and I can only say best thing for it.Syma is famous drone brand and they manufactured many good drones.This is one of their most produced models and we will agree that its design is similar to DJI phanthom.X8C is large and heavy quadcopter with weight of 600 g and size 50 x 50 x 19 cm. Camera and battery are installed in.Big propellers and large 2S 2000mAh battery are necessary to put this quadcopter in air.All this power means that it can fly up to 12 minutes with control range of 200 meters.This drone is wind resistant and packed with 2 MP camera. It has a Headless mode feauture and it looks really cool by night because its has LED lights. All in all, drone that conquered my hart with its power and performances.